A stunning graphic novel from an extraordinarily talented illustrator. On the cusp of having everything slip from his grasp, a young boy has to find a way to rebuild his sense of self. An ordinary boy in an ordinary world. With no words, only illustrations, Small Things tells the story of a boy who feels alone with his worries, but who learns that help is always close by. A universal story, told simply and with breathtaking beauty, about dealing with sadness, anxiety, depression, heartache or loss, and finding your way in the world. “An ordinary boy in an ordinary world. Small Things tells the story of a boy who feels alone with his worries, but who learns that help is always close by." Mel died before she completed her book and the wondrous Shaun Tan completed the final three pages. And in doing so, he turns the darkness around into a powerful and hopeful ending so that even though there are small things that can cause such despair and desolation there are other small things that can lead to hope and happiness. With so many of our students, even very young ones, struggling with bullying and mental health issues that too often lead to the dire consequences of drugs and death, this is an important book for teachers to examine so we can be alert to the needs of the children in our care and consider whether the remark made in jest or the less-than-average grade might have a deeper impact than we think. It's about the need to help our children build a core of resilience and self-esteem so they can cope when their expectations are not realised and to help parents understand that stepping in and solving every problem for a child in the short term in not necessarily the best solution in the long term. It's about helping our children understand that there are not losers, only learners. It's about so much more than one reviewer can express in one review. Perhaps its most critical role is that it even though it encapsulates the feelings and thoughts of the boy in its evocative pictures so well that no words are needed, it becomes the conversation starter - more than that, it generates a loud call to action. On a literary level I believe this will feature in the CBCA Book of the Year lists in 2017; on a social level it is so much more important than that. There are Teachers Notes for both primary and secondary available and they come with a warning of how you use it because of the nerves that may be touched, a warning I would echo. Do not share this as a stand-alone, time-filler. However, they offer some really positive ways of promoting positive mental health and strategies for those who are feeling fragile as well as helping others know how they might help a friend. Asking R U OK? is not just for one day a year. A most remarkable and life-changing book. We need to nurture those who will sit with the lonely kid in the cafeteria but we must also know who the lonely kids are. Everything within this graphic novel has been intricately considered. The title is in lower case letters, to emphasis the wording: small things, it is simple and succinct. 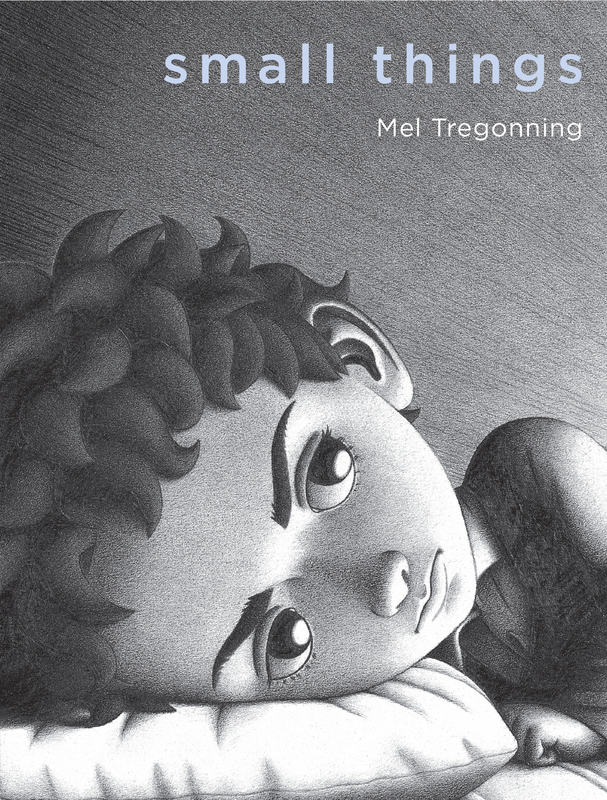 The colour tones emphasising the darkness of the child’s worries, the lack of written text allows the reader to feel the universalness of the child’s experiences, the layout too provides the reader with the opportunities to bring their own thoughts and experiences to this picture book. It is all the small things in this book, however, that contribute to the overall worries that continually follow and plague the young boy. Emphasised from the start, the first double page spread encapsulates the trials of team sport, the awkwardness of not fitting in and being unsporty, clumsily tripping over, etc. However, as you turn the page, a strategically placed helping hand is offered, in the top left corner. The school setting continues with another double page of blacks, whites and greys and the student being followed with classroom and academic worries. Images of isolation and darkness are intermingled with the repetition of a face that tries to help. By the end of this beautifully illustrated book, the boy discovers he is not isolated, he doesn’t have to face this alone, that there is a support network and that others have worries following them too. The boy comes to turn with his worries and they no longer affect him. It is then encouraging to see that he is able to help others too.